→Which are The Best Pool Testing Kits and How to Choose? Pools need care, whether they are public or home pools. Most people who've owned a pool know this, especially if they've used it regularly. After all, the pool boy is not there only for the wife's joy, right? In fact, most pool owners will agree that the care you need to put in your pool is often more annoying than the monetary price of maintaining it. What is a Pool Testing Hit, However? Don't worry, it's nothing complicated and there's a plethora of guides and videos on how to use a pool testing kit, what the basic chemistry of it is, how to utilize its results, as well as on when do you actually need a pool test kit. And if the chemistry scares you, Don't worry, you don't need to be expert at that, Just following the test guideline then compare with the chemistry level table. That will ease your worries, right? 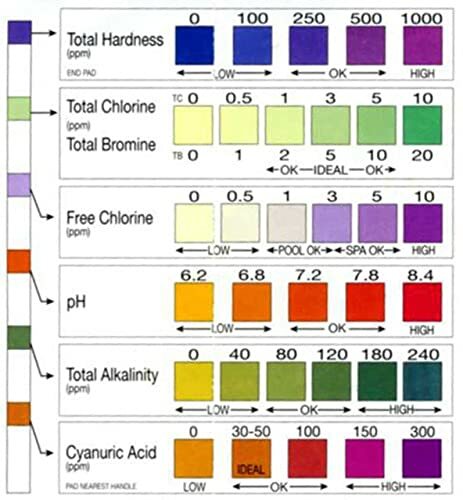 There are quite a lot of things to look for that a pool test kit can easily help you with. Does it sound complicated? Well, we imagine for some it might. We promised that it isn't however and it's truly not – It's just several variables that need to be kept in mind and that are really easy to follow with a help of a nice pool testing kit. So How to Choose The Best Pool Test Kit then? Well, there are a lot of things that can be considered, and as we said - there are a lot of manufacturer that go over them. The gist of it is quite simple, however - go big or go home. If you're regularly using your pool then its water's quality is as important as the air around you. As with all other types of products, there are a lot of low-quality pool testing strips, duo test kits, etc. – products that aim to simply take your money and not give you much value in return. However, if you're actually looking for something that'd help you keep your pool clean, you want what the pros are using. Taylor Technologies Inc. is a company that's been setting the standard in this industry for the past half a century. The company itself has existed since the 1930s and is in the business of pool testing kits since the 1960s. They have a vast array of testing kits but of all of them, we'd recommend this kit. It tests for all the factors we mentioned earlier. It includes 75-ounce reagents and comes with a Taylor 9058 comparator. The kit is very easy to use and comes with a helpful pamphlet that perfectly explains not only how to utilize it, but also how it works – not only will it help you keep your pool clean, but you'll become a specialist overnight! The color-coded testing sheet will guide you through any problem and you'll soon forget about all the trouble you used to go through with your neighborhood pool store and their often crappy advices. Here is another great option. It's filled with features and tools that’d help you out in all your needs. It comes with a Polyethylene case and includes clear-view round test block with matching color caps to solutions. It's also easy to use with its simple color readings. Poolmaster is an American manufacturer that’s been around for quite some time too – ever since 1958. They offer a great variety of products related to pools and spa, and have always been a major worldwide factor in the area. And not without reason - This 5 Way test kit proves it perfectly. Affordable, ideal for most people's pools, this kit will make you enjoy taking care of your pool. The nice plastic box, with comfortable individual compartments for all vials and components is a nice touch as well. This is another pool test kit from one of the originators in this area - LaMotte. Created in the 1930s, LaMotte - a family run company to this day - serves a huge spectrum of pool and spa products. 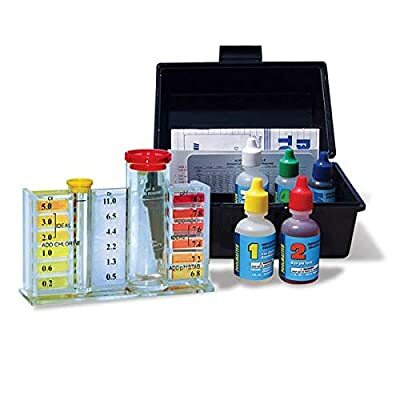 Out of all of its water test kits, we recommend this one for a lot of different reasons. It comes with a photometer which gives the user digital readings of the results. It comes with a water resistant case. The ColorQ Pro 7 tests for everything a pool owner needs. 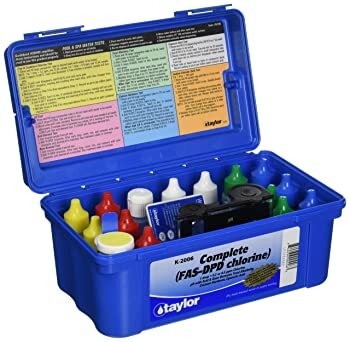 Some users might be a bit turned off by this kit because it uses liquid reagents for most of its test factors (and tablets for the Cyanuric Acid test), instead of powder. 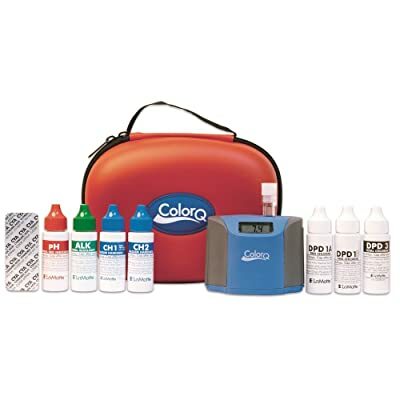 Of the three pool test kits we're mentioning here, the ColorQ Pro 7 has the most additional features. This great pool kit is ideal not only for home, backyard pools, but for bigger, public ones as well - there's almost nothing it can't handle. Uses liquid reagents instead of powder reagents which is not a definite negative, but is still viewed as such by some users. In the industry of pool and spa products, there are companies that have been around for close to a century and have constantly been setting the standard, and there are manufacturers that make cheap knock-offs which offer almost randomized readings. Tayler, LaMotte, and Poolmaster are three of the few most prominent manufacturers out there and will never disappoint you. Each of the three products we mentioned here is worth their price and more and will make taking care of your pool a pure joy and protect you from skin, hair and scalp issues as well. Thank you so much for the layout of your website and the suggestion of pool testing kits. Very helpful and straight to the point. What is The Best Eyelash Extension Glue that Lasts?